I love the feeling of a bohemian wedding. It feels so relaxed. And of course, there is a lot of planning that goes into making it feel effortless. It's like the whole "natural" makeup look. I think it takes more time to look natural than it does to put on a full face of makeup for date night. If you're planning a boho wedding and realizing that it's a lot of work to look effortless, don't worry. I'm here to help. 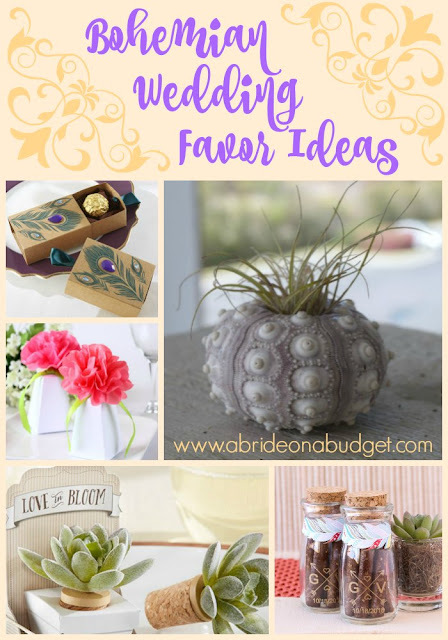 I put together a list of really great bohemian wedding favor ideas. Bohemian weddings are filled with bright colored flower, feathers, greenery, and people without shoes. So of course, I have to start this list off with flower soap. What I love even more is that it comes packaged in a box with bright flowers on it. That will dress up your table without you even needing to do anything. We went to a wedding earlier this month and the wedding favor was an air plant in a seashell. In fact, you may have seen it on our Instagram page and that's how you found this post. I really liked the favor, especially for anyone who was traveling (like we are). 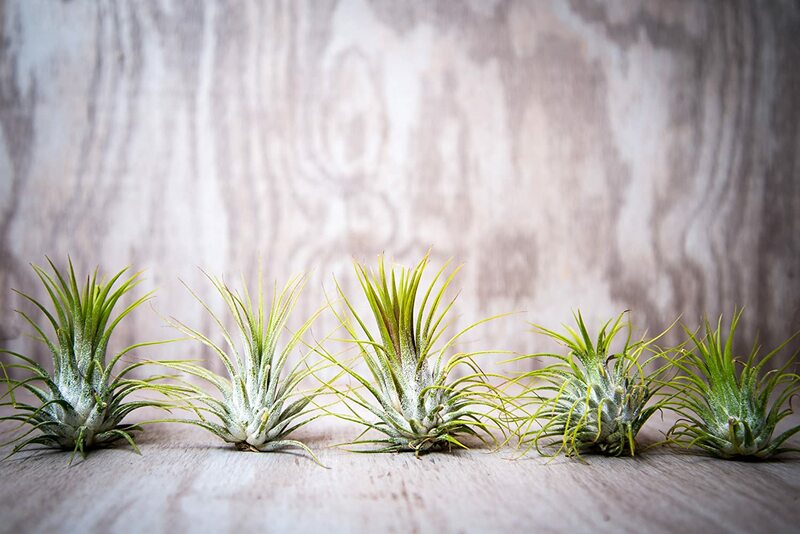 They're low maintenance, travel easily, weigh basically nothing, and add greenery to your bohemian wedding. You can find them at a local greenhouse or you can purchase here. I'm really all about your favors doubling as decor for your bohemian wedding because the key is simplicity. That's how you achieve that relaxed "I just showed up and this wedding was here" vibe. These pom pom favor boxes really help that. 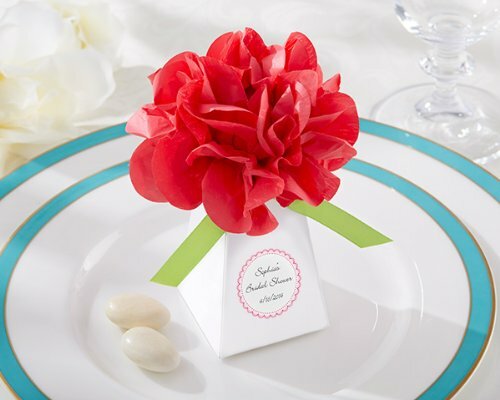 The paper flowers look just like carnations too, so you can get away with using those on your tables (and saving money!). If you're planning a bohemian wedding, you should hang rope dream catchers around. They're really nice decor (even though no one is sleeping and bad dreams don't need to be caught in them). Carry that theme into your favors. 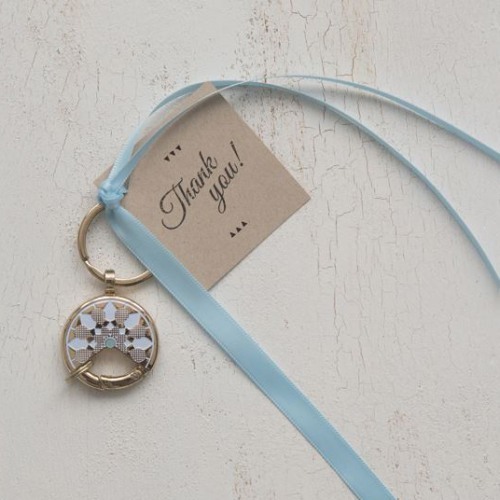 You can pick up dreamcatcher keychain as favors, leaving everyone with only good dreams. 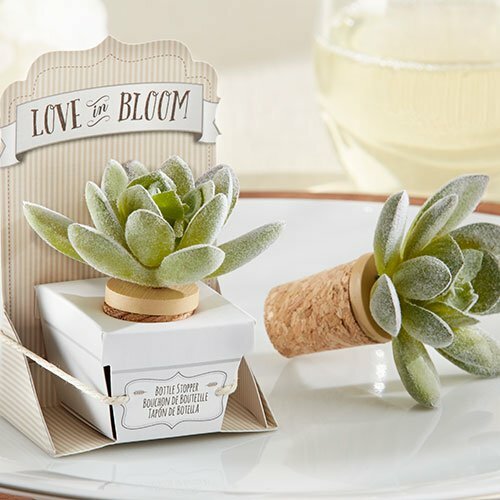 If you want to add some greenery -- but you're a bit worried about your guests caring for living things -- go with the "Love In Bloom" succulent bottle stopper. It's a faux succulent, so you get the feel of it but not the responsibility. If you want to add live succulents to your boho wedding, check out our succulents in shells wedding centerpiece post. 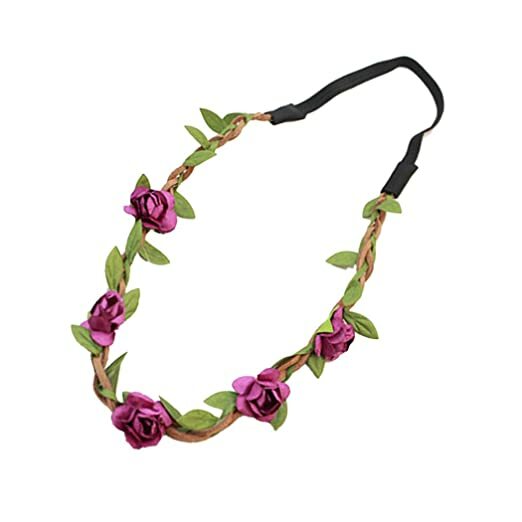 If you have a bohemian wedding, and I'm on the guest list, give a bohemian floral elastic headband as your favor. I love them. And I just love that all your guests will be wearing them by the end of the night and it will just make for such beautiful photos. I'm a fan of favor boxes, mostly because you can fill them with anything that's any color. All that matters is the box itself matches your theme. 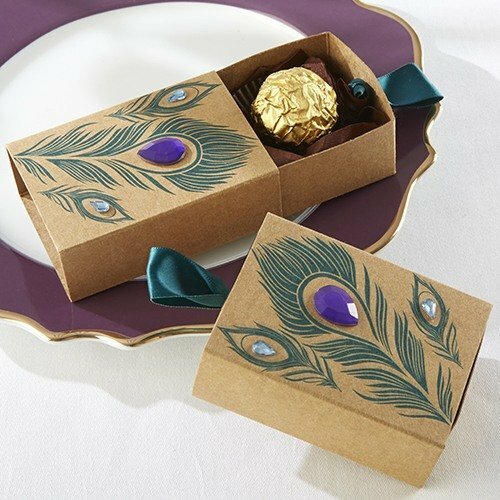 If you agree, pick up these Jeweled Kraft Peacock Feather Boxes. Fill them with sale candy, mints, anything. The box is boho and beautiful. 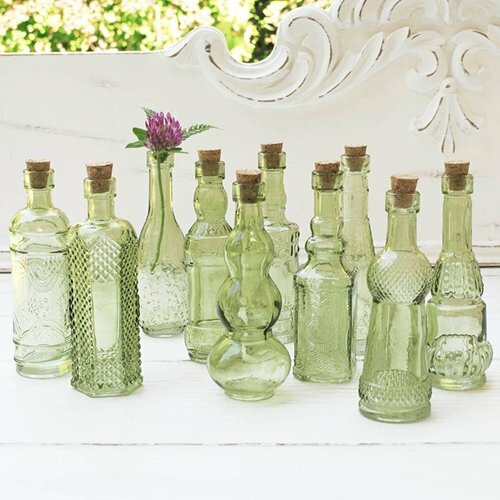 You'll want to add a bit of vintage into your bohemian wedding, and a good way to do that is with vintage glass bottles. You can stick a flower in each and use them as your centerpiece, telling your guests to take one home with them, or you can put one at each seat. Purchase at your local thrift shop. This is a combo of a couple favors before this, so if they didn't exactly hit the spot, maybe these dream catcher bud vases will. They're five-inches tall, so they'll look great holding small flowers or leaves from plants that need to grow back (right now, my grandma has one in a cup, so she needs this favor). I think bottle openers are a great favor idea. They're so handy that all your guests will take them. 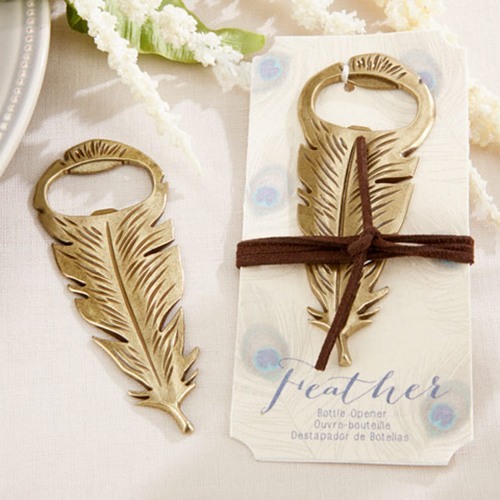 So if you want one for your boho wedding, go with this feather bottle opener. It comes packed with the card and cord, making your life s much easier. If bohemian is your wedding theme, be sure to check out our bohemian wedding invitations ideas. We also have a bohemian wedding Pinterest board you might like. BRIDAL BABBLE: Which of these bohemian wedding favor ideas is your favorite?